Sisters of Mercy will companion you throughout the various phases of inquiry and discernment in your exploration of life as a Sister of Mercy. During this phase (minimum of six months) you would talk with the Vocation Director or another Sister of Mercy about your desire to follow Jesus as a woman religious. You would learn about the Mercy Congregation and our mission. This phase (a minimum of six months) is a period when you would meet regularly with the Vocation Director. Through prayer and spiritual direction, you would examine your motivation and capacity to live apostolic religious life as a Sister of Mercy. During this time you would have a live-in experience of at least one month in a local Mercy community. During the period of candidacy (nine – twelve months) which begins with a simple ceremony, you would live in a local Mercy Community. You would continue your regular employment and at the same time gain a realistic experience of religious life. You would engage in on-going discernment through regular meetings with Director of Candidacy. 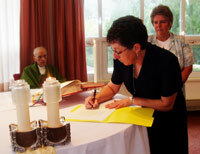 The Novitiate, a two-year process, would be devoted to full time living as a Sister of Mercy. Under the guidance of the Novitiate Director, you would continue in mutual discernment. Novitiate is a time for deepening of spirituality, confirmation of call and initiation into the apostolic religious life of a Sister of Mercy. Following the Novitiate, you would make your first profession of vows of chastity, poverty and obedience. Ordinarily the period of first commitment is five years’ duration, with an annual renewal of vows. Under the guidance of the Formation Director, opportunities are provided for you to continue your formation as a vowed woman and to discern with the congregation your readiness for permanent commitment as a Sister of Mercy. As your call to live as a Sister of Mercy is confirmed through your lived experience and mutual discernment, you make a life-long commitment in your Final Profession of vows.